Section 1: The President shall preside at all meetings of the club and all Board meetings, unless excluded from the Board meeting in accordance with Article III, Section 10 of the Constitution. The president shall enforce strict observance of the Constitution and Bylaws and expenditures of $100 or less for a single person may be approved by the President acting on his own authority. All expenditures between $100 and $500 will require additional approval by a telephone or mail ballot of a majority of the board members. All expenditures over $500 shall require the written approval of a majority of the Board, except that these limits may be set aside upon joint declaration by the President and Treasurer of a financial emergency requiring immediate action. In the event of such a declaration, the President and Treasurer shall report the full and complete details in writing to the board within 10 days of their action. No part of this section may be construed as relieving either the President or Treasurer of their individual fiscal responsibilities to the club. The President also has the authority to appoint all committees and personnel. When a new President is elected, he/she shall have authority to eliminate or replace any or all committees and personnel for his/her term of office, or shall declare that present personnel shall continue to administer their previous duties. Section 2: The Vice President shall assist the President in the discharge of his/her duties and act in his/her absence in routine matters of administration, but not in formulating any new decisions, unless approved by the President and a three-quarters vote of the Elective Officers. Section 3: The Board Secretary shall handle general correspondence and preserve all documents and files. He/she shall submit necessary reports and other material required by the governing body, and act as the center of communications for the Board of Directors or from any member of the club who wishes to address the entire Board. Section 4: The Treasurer shall maintain in good order all organization accounts and funds. He/she shall, under proper authority, issue funds as required in payment of just debts and expenses, and shall issue, semi-annually, a financial report to the Board and to the membership. He/she shall file all necessary federal, state, or local tax returns. He/she shall supervise all financial matters pertaining to the club and keep accurate records of all transactions. He/she shall be bonded at the club’s expense for an amount of not less than forty (40) thousand dollars. In the event that the Treasurer, for any reason, becomes unable to sign checks, there shall be the following line of succession of Elective Officers who may sign checks: first the President and second, the holder of Board Seat 1 (Membership). At the time of the transfer of the treasury from one person to another, or at any time, at the discretion of the Elective Officers, the Treasurer shall release all books and records to an outside independent audit firm for the purpose of checking and auditing the club accounts. The expense of such an audit shall be paid by the club, and shall not be paid to any member of the club or to his/her affiliates. The Treasurer will prepare an annual budget for the approval of the Elective Officers, such budget to show in detail expected expenditures and projected income with recommendations for covering any expected shortfalls. The Treasurer is responsible for initiating and running any fund-raising programs for the club including Winner’s Windfall and the CONECA auction. Appointments to be supervised: Auctioneer. Responsible for all areas of membership, including recruiting programs, welcoming new members, preparing and issuing membership cards, preparing and issuing membership applications, following up on members who fail to renew, maintaining a current membership list by class of membership, receiving and sending to the Treasurer all dues and monies resulting from membership activities, providing the publisher of the club publication with an accurate and up-to-date list of current members, and maintenance of the club’s email membership list. Appointments to be supervised: Winner’s Windfall Chairperson. Responsible for all areas regarding the preparation, printing, and distribution of the club publication, the Errorscope. This includes soliciting articles, advertising, editing, and maintaining a back issues ordering system. Responsible also for the annual entry into the ANA Outstanding Club Publications Contest. Appointments to be supervised: Back Issues Chairman, Advertising Chairman Assistant Errorscope Editor(s). Responsible for providing special activities for the Junior Members of the club including special functions and a scholarship program for the annual ANA Summer Seminar. Appointments to be supervised: none. Responsible for all club public relations including club publicity and the handling of grievances. Responsible also for the conduction of regular elections to ensure newly elected officials can assume their positions in December of even numbered years. Responsible for conducting any special elections. Election responsibilities include soliciting candidates; soliciting candidate platforms; coordinating with the Errorscope Editor printing of pertinent election data including candidate platforms, preparation of the election ballot to be included in the Errorscope, receiving and counting ballots, and announcing the results of any election. Also responsible for conducting membership referendums in accordance with Article II, Section 4 of these Bylaws. Appointments to be supervised: Election Chairman. Responsible for development and regular maintenance of the content of the club’s website including quarterly rotation of the feature article, updating the biographies of Officers, Board of Directors, Hall of Fame members, Literary Award winners, and any other special recognitions, uploading of articles from past issues of Errorscope into an education center, and any other function the Board of Directors approves for the club web site. Appointments to be supervised: Web Technician(s), Assistant Website Editor(s) . 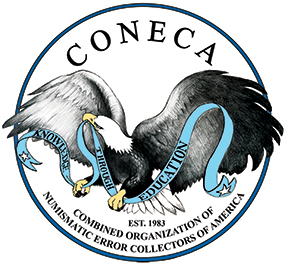 Responsible for initiating and running the attribution and examination services to club members, acting as a liaison between the third party grading services and CONECA to maintain the CONECA slab program, and giving oversight to the publication of all specialty books including the publication of the CONECA RPM and Doubled Die files. Appointments to be supervised: Attributers, Examiners. Responsible for the preservation of documents pertaining to any noteworthy CONECA accomplishment. Solicits nominations for the consideration of the Elected Officials to vote on for election to the CONECA Hall of Fame / Dr. Lyndon King Award. This election will take place at the annual meeting of the Board. Coordinates with the Errorscope editor and Webmaster to obtain a list of all submitters of literary works during the award-year; obtains awards of recognition to be given to each submitter present at the annual Errorama Awards Ceremony and mails out the balance of awards after Errorama. Maintains the club’s library. Appointments to be supervised: Librarian. Responsible for the planning, coordination, and implementation of any and all actions necessary to hold the annual Errorama including any awards relating to exhibits. Acts as CONECA’s liaison on any matters concerning the ANA. The Board member may perform any of these assigned duties himself or recommend to the President a member to be appointed as an assistant to perform any of the various functions under his responsibility. Such appointments, however, do not relieve the Board member of the responsibility of ensuring his Board seat duties are carried out. Each Board member will prepare a report on his Board responsibilities and what has been accomplished for publication in the Errorscope each August. Section 6: No monetary remuneration shall be paid to any officer or member of the club for his/her services, except for services or materials provided over and above the normal duties of the position, provided that the Elected Officers establish by a majority vote a payment schedule for specific services considered to be in excess of that expected from voluntary duties. Section 1: The club shall hold at least one meeting of the Board and of the membership each year; at the discretion of the Elective Officers, such meetings may be held separately or may be combined. Special meetings of the Elective Officers or the membership, or both, may be called at any time, provided that all regular and special meetings must be announced in the club publication no less than 30 days prior to the set date of such meetings whenever possible. Such meetings of the membership may be held by mail; these meetings do not require 30 days notice. Section 2: In order to conduct official club business there must be two-thirds of the Elective Officers present or voting. Proxies must be submitted in writing to the President at least one week prior to any physical meeting. Section 3: The annual Board meeting shall be open to all members. The Board may at its discretion go into Executive Sessions at any time, which will necessarily exclude the members who are not part of the Board of Directors. Section 4: All Board actions shall be subject to appeal and referendum by the membership following publication of such Board actions in the club publication or some other suitable form of communication with the membership. Upon request and application by more than 5% of the eligible voting members of the club, the Board action shall be stayed, and a mail ballot of the membership conducted by the Director of Special Services and Elections, provided that such protests are received by the President within 30 days of the publication of the Board actions in the club publication or other form of communication. The announcement of the mail ballot will appear in the next issue of the club publication and the mail ballot conducted immediately thereafter with the results to be announced as soon as possible in the club publication. The decision of the majority of the membership is final. Section 5: Robert’s Rules of Order shall be the parliamentary authority for all meetings of the Board or the membership. Section 6: The official business of the Board may be conducted by mail, telephone, telegraph, email or in person. Any Elected Officer may initiate an action by communicating a motion to the President or the Board Secretary. The motion will be communicated to the Elected Officers for possible action, with the Board Secretary charged with investigating and reporting on the facts of the matter, soliciting pertinent material, and advising the Elected Officers on possible courses of action. All matters agreed upon by telephone shall be followed by written confirmation of each member’s vote communicated to the President within 7 days of the telephone vote. Section 1: Annual dues for all types of memberships shall be determined by the Elective Officers at the annual Board meeting. Any member wishing to purchase a Life Membership shall have been a regular member in good standing for a period of at least one year prior to purchasing the Life Membership. Section 2: All members shall have their dues renewal times determined on an individual basis, based on the time of their acceptance into membership. Notice of the renewal time will appear on the cover of the club’s bimonthly publication. Any member in arrears for a period of more than two months shall be dropped from the membership rolls. Section 3: The duties of the Director of Membership are as described in Article I of these Bylaws. Section 4: All applicants for new or reinstated membership shall be published in the club publication; any member may object to the Board Secretary if he/she has reason to believe the proposed member is not suitable. The objection must be submitted in writing and include the reason(s) for the objection. Upon receipt of such a written objection the Elective Officers must vote upon the application within 60 days or the applicant is automatically accepted into the club. The Elective Officers, upon completion of a vote on the application, shall notify the Director of Membership as to whether to accept or reject the application. Barring such objection or rejection by a majority of the Elective Officers, the application is considered to be accepted 30 days from the date of publication. Section 1: The Director of Special Services and Elections shall be in charge of all elections of officers of the club, as well as special elections and special ballots, and shall insert timely announcements soliciting nominations in the club publication. He/she shall establish the requirements as to the submission of autobiographical material to be published for the benefit of the voting members and shall issue official ballots which may be printed in the club publication, inserted therein, or mailed separately. a. A member declaring candidacy for a Board seat will get that seat if his/her vote total is within the eight highest vote totals received and the highest total of any candidate running for that seat. b. Any remaining Board seats will be filled from the remainder of the eight candidates with the highest vote totals. These candidates will select the Board seats they wish to occupy from those remaining after application of Article IV, Section 2a of these Bylaws until all seats are filled. Disputes arising from more than one elected Board member selecting the same seat shall be resolved by assignment of the seat to the member with the highest vote total. Section 3: Ballots are to be mailed to the membership not less than 30 days prior to the date of any election, and must be postmarked no later than that date to be counted as valid ballots. The results and totals of all votes for any elective office will be tabulated by the Director of Special Services and Elections or his/her designee and announced in the club publication in the next issue following the election. Elective Officers will assume their offices upon written notification from the Director. Section 4: Any member in good standing, except Honorary Members, shall be eligible to vote. Any member in good standing, except Honorary and Junior Members, shall be eligible for candidacy for elective office. The above is provided the member has not been ruled ineligible by the Board because of any disciplinary action taken under the provisions of Article V of these Bylaws, which action is then still in effect, or who has not been declared eligible for office under the provisions of Article V.
Section 1: Resignations shall be acted upon by the Elective Officers within 14 days of proper notification of the Elective Officers by the President. The President may wait a period of 60 days before submitting the resignation to the Elective Officers in order to allow the person resigning the opportunity to reconsider. Once presented to the Elective Officers, the resignation may be accepted or rejected by them. Section 2: Conduct by any member, which upon consideration by the Board, shall be deemed detrimental to the welfare of the club or the hobby as a whole, or contrary to the avowed aims of the club, shall be subject to penalties ranging from reprimand to expulsion at the discretion of the Board by majority vote. Any Officer, whether elected or appointed, who has been removed from office, who has been requested to resign his/her office by the Board as a result of such disciplinary action, or who has resigned from the club and has later been reinstated, shall not be eligible for election or appointment to any office in the club unless reinstated to eligibility by further action of the Board. Section 3: Any member who resigns or quits his membership in the club shall be deemed eligible to vote upon his/her reinstatement to the club, but ineligible for election or appointment to any office for a minimum of one year after being reinstated to membership, and must make formal application to the Board in order to be declared eligible for election or appointment. Any member who has been removed from office or requested to resign because of disciplinary action may formally request a reinstatement of eligibility to hold office after a minimum of one year. The Board will rule on such applications by majority vote. Section 4: A Grievance Committee consisting of a minimum of three members of the club, one of whom shall be a Board member who chairs the committee, shall be appointed by the President. All grievances against a member of the club shall be submitted to and investigated by this committee. The committee shall do its best to resolve the grievance; however, should the committee be unable to do so, the Chairman of the Grievance Committee shall brief the Board Secretary on the findings and recommendations of the Grievance Committee. The matter will then be presented to the Board for a vote upon resolution of the situation. The decision of the Board is final; failure to comply with the decision of the Board could result in disciplinary action by the Board. Section 1: The club shall maintain a library for the benefit of all members. The librarian shall be responsible for the acquisition and safekeeping of books, slides, catalogs, photos, and other materials, and shall, with the Board’s approval, periodically publish rules for their loan to the members. 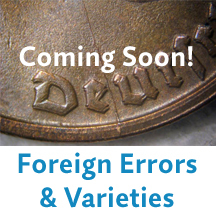 Section 2: The club shall maintain a committee of qualified experts for the express purpose of examining and authenticating numismatic errors and varieties. Appointments shall be made by the President with the approval of the Board. A nominal charge will be established by the Board for this service to cover postage for return of the coins, possible photography fees, authentication certificate printing fees, and a minimal charge for the authenticator’s time. This fee shall be reviewed by the Board on an annual basis at the Board meetings. A limit may be placed on the quantity of items to be submitted to anyone person at any given time. Section 3: The club shall publish a bimonthly periodical to be known as Errorscope, which is designated as the official club publication. The Editor shall be responsible for soliciting and editing letters, articles, news items, official notices, and other such matter as is deemed appropriate for publication. The Board shall establish specific policies pertaining to the suitability of material and direct the Editor in the pursuit of those policies. The Editor may appoint necessary assistants with the approval of the Board. The club publication will be published bimonthly unless approved otherwise by the board. Section 4: The club mailing list shall be considered strictly confidential and shall be used solely for club purposes. Members’ addresses shall not be provided to any club, organization, or dealer unless permission to do so is granted in writing by the member. Section 5: This club shall not as a single entity become affiliated with any other similar organization, corporation, or business except by a majority vote of the Elective Officers. 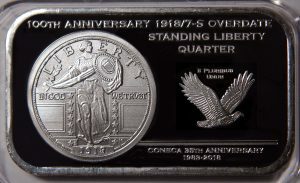 Club memberships in major national, regional, state, or local general numismatic organizations are not disallowed in this section. Section 1: These Bylaws may be amended by a majority vote of the Elective Officers, provided notice of the proposed amendment be published in the official club publication 30 days prior to the effective date of the amendment. Section 2: If objections to a proposed amendment are received by the Board Secretary from more than five percent of the voting membership before the effective date of the amendment, it will be placed on a special ballot and put before the entire voting membership for a vote. If the majority of members voting approves the amendment by ballot, the amendment will become effective. If the majority of those voting rejects the amendment, it will not become effective, and cannot be placed before the membership again until a period of one year has elapsed since the membership vote.